The Future Youth office in Beirut is buzzing with young people preparing to mark the anniversary of the death of former Prime Minister Rafik Hariri. 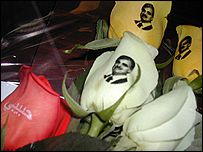 A youth comes in brandishing a bunch of roses, each printed with the face of the former leader, who was assassinated in a car bombing a year ago on 14 February, Valentine's Day. On the walls, posters show an estimated 800,000 Lebanese gathered on 14 March 2005, united behind the demand that Syria - now implicated in the bombing by UN investigators - end its 29-year military presence in Lebanon. With Christians, Sunni Muslims and Druze standing side by side, the rally was a rare moment of cross-confessional unity in a country torn by 15 years of sectarian civil war. But a year later things look very different to the young people who played a major role in the protest. 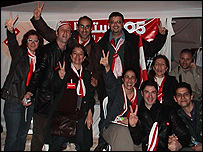 "The whole dream of 14 March 2005 has evaporated," says Nader Nakib, president of Future Youth. "Now it's very hard to do anything like what we did last year. I believe to recreate that period could take years." In the wake of Hariri's death, an unlikely alliance formed between the biggest Sunni and Druze political parties, and a mix of Christian and other parties. Young activists from a wide range of religious backgrounds set up tents in Martyrs Square in central Beirut and stayed for more than two months. "It was the best thing in my life. It was being Lebanese - not thinking of what sect or religion you belong to, purely thinking of your country, Lebanon," says business student Rabih Ammar, 23, who is Druze. Asmaa Andraos, 34, was among the minority involved who were not aligned to any political party. She says in the beginning the young protesters stuck to their own tents, but after four weeks they were all sitting around the same fire. "For years these people were made to believe by their leaders that the others didn't like them or were monsters who wanted to kill them ," she adds. "It took time for them to realise that we can talk, we can laugh, and eventually we can become friends." In two short months, the pro-Syrian government collapsed, Syrian troops withdrew and Lebanon's pro-Syrian head of security resigned. But the coalition foundered amid political wheeling and dealing as June parliamentary elections approached. With their main demands met, the young activists packed up their tents and left. Some maintained their connections, but as one Christian party split from the alliance, it became clear the mood had changed. "As soon as we started talking about elections, everything fell apart," says Nader Nakib. "Everyone started thinking of himself, his own party or agenda. And in Lebanon, because the parties are confessional, when the parties fight, the sects start fighting." Nine months later, this is a common theme among the students sipping cappuccinos in Beirut's trendy coffee shops. Many feel that sectarian attitudes have increased. Although the 14 March demonstration brought Sunni Muslims, Druze and Christians closer, the divide between them and the more pro-Syrian supporters of the Shia parties has deepened, particularly over relations with Syria and the future role of the militant Hezbollah movement. Zahi Chahine, 22, works for Development for People and Nature Association, an organisation which runs inter-confessional dialogue workshops for young people. He and his colleagues talk of increased tensions during discussions and rising sectarianism in universities. At one campus, frequent punch-ups are reported between 14 March supporters and the pro-Syrian Lebanese who staged a "Thank-you to Syria" demonstration on 8 March as the Syrians began to pull back. Mr Chahine also talks of growth in what he describes as "the leader-follower thing" - unquestioning loyalty to political party heads, many of whom were - or are sons of - wartime leaders. Among young people, views about 14 March vary widely. Some recall it as a moment of hope that set the country on the right track. Others see little but political power play and fear another civil war. Among those who lived the intense days of "Camp Freedom" there is disappointment. "Many of us feel resentment towards the politicians that supposedly represented us," wrote an anonymous contributor to the camp's website in the wake of the election. "Most of us are left with a feeling now that we were let down, that all of these high aspirations were gone to waste, and that the country is just as divided as it was before with the same sectarian and feudal chasms." But that is not the whole picture, asserts the writer. "If it weren't for all the demonstrations there would have been no such thing as free and fair elections... We would still be controlled by our neighbour." And in Martyrs Square, although the crowds and tents are long gone, a new covered stage has been built for political meetings. It is run by a committee of young leaders drawn from some of the 14 March coalition, a modest legacy of the bridges built during the camp. "I feel that for one day in history we had victory. We did lose a lot of what happened back then. It's sad, but maybe one day we can accomplish it again," says Nader Nakib. Heather Sharp is in Lebanon on a research visit funded by the Alexander Onassis Trust.